Lots. 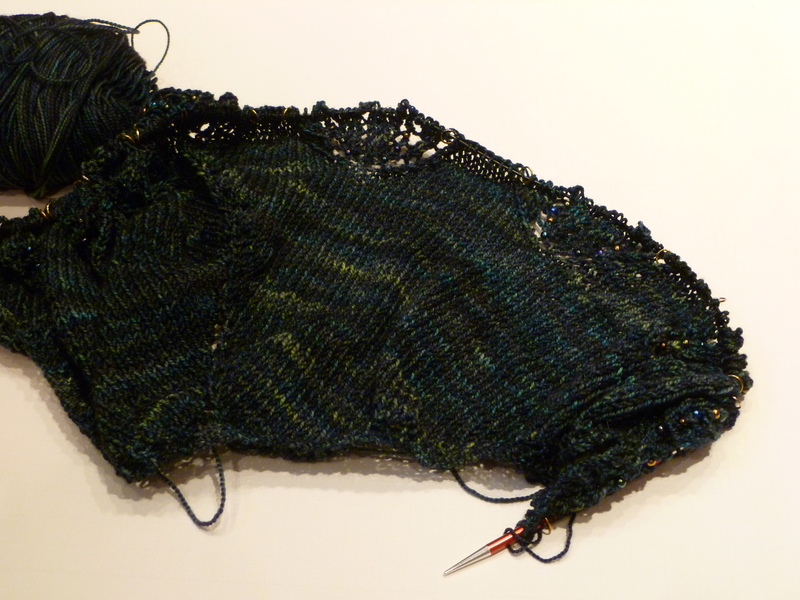 I knit the body plain (similar to the body of the Ishbel shawl). 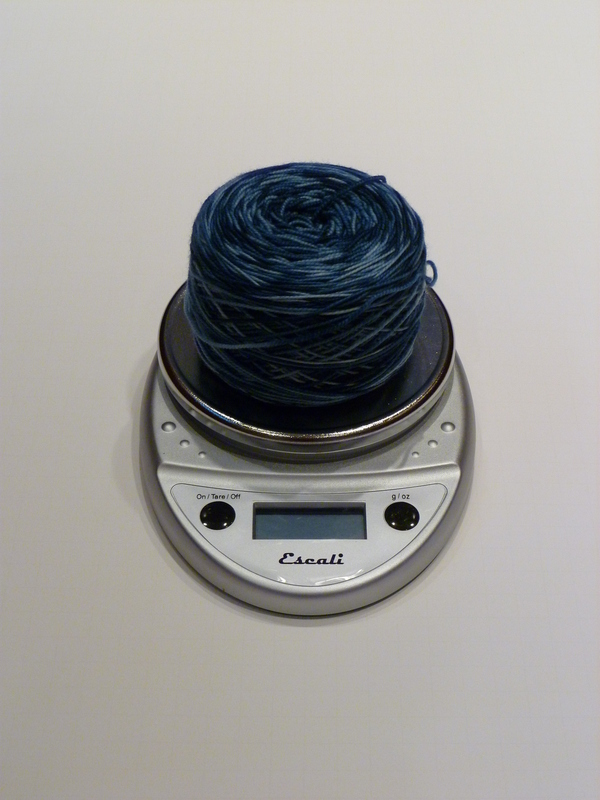 I used my yarn scale and Excel to calculate how many petals I could get out of the single skein of yarn I had. I added extra clusters of petals at either end to maximize my yarn use. 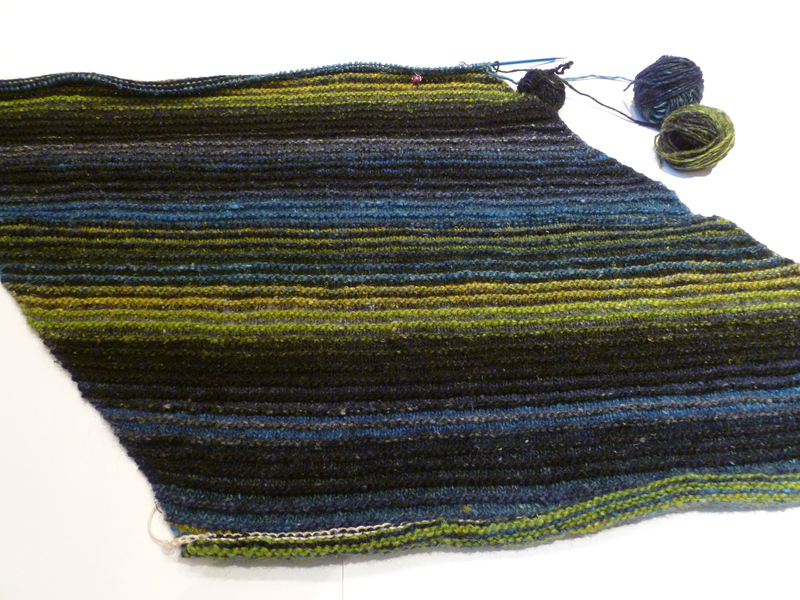 (And I ended up with only 3g of yarn when all was said and done). 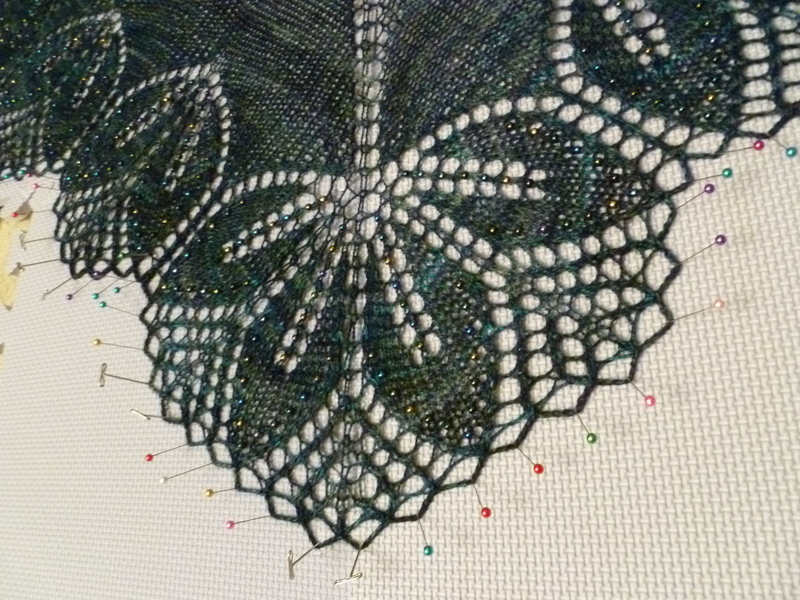 I added beads along the stem and the edges of each petal, using the crochet hook method. 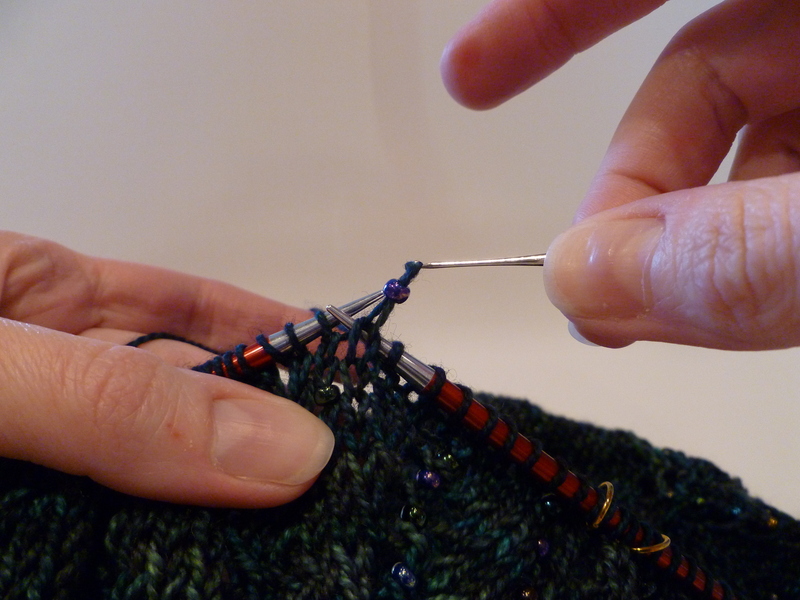 The crochet bind-off was new to me. A little slow to execute, but again, well worth the effort. It might have looked a little bit better with a slightly smaller hook. I’m very glad I learned how to crochet before I tackled this! Less than a year. 🙂 I cast on for this in May of 2011, right after MDSW. 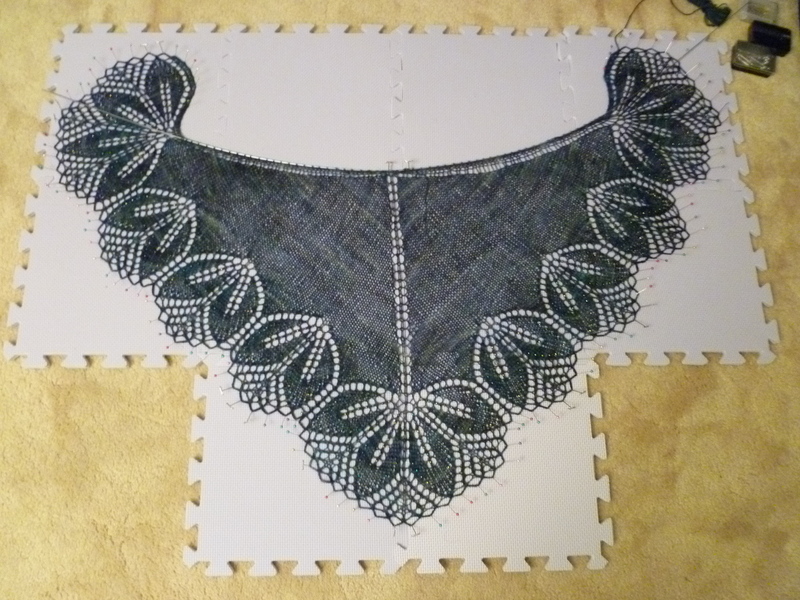 I finished the plain portion in a week or so, and then it sat through the summer and into the winter, while I bought beads and figured out what size to make. 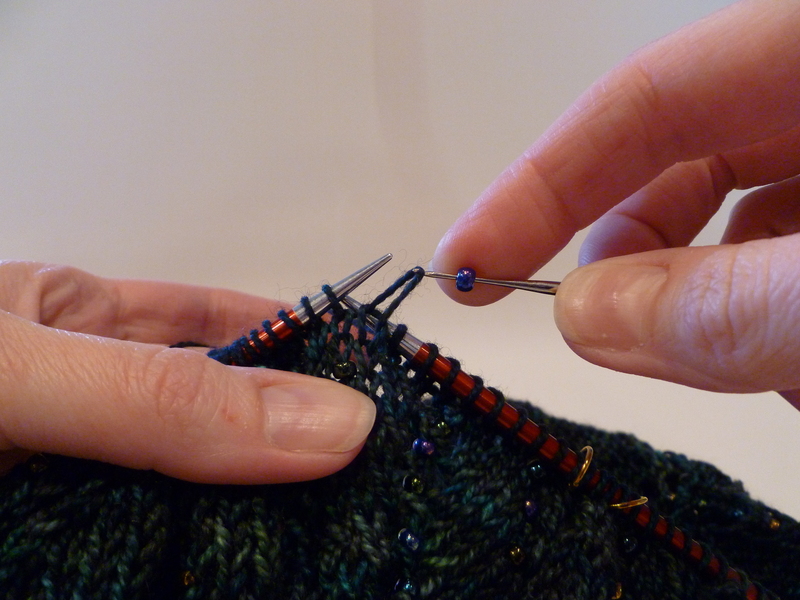 The dark yarn and the beads made this project slow going. Love, love, love it! This may be the most beautiful thing I’ve ever made. I had exactly 3g of yarn left and 18 beads when all was said and done, so yay for the scale and spreadsheet method—I was able to use up as much of the yarn as I possibly could. 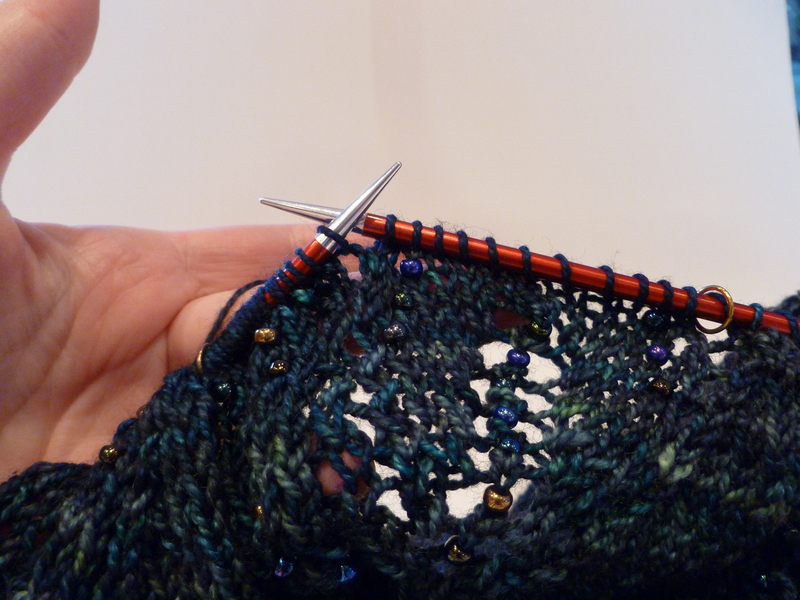 It uses a crochet bind off that I hadn’t used before. 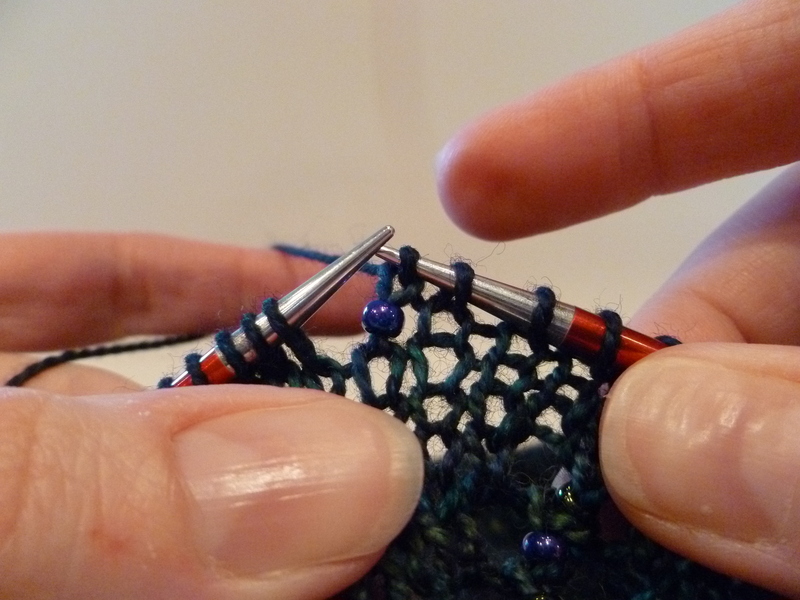 Can I tell you how glad I am that I spent some time this winter learning how to crochet?! 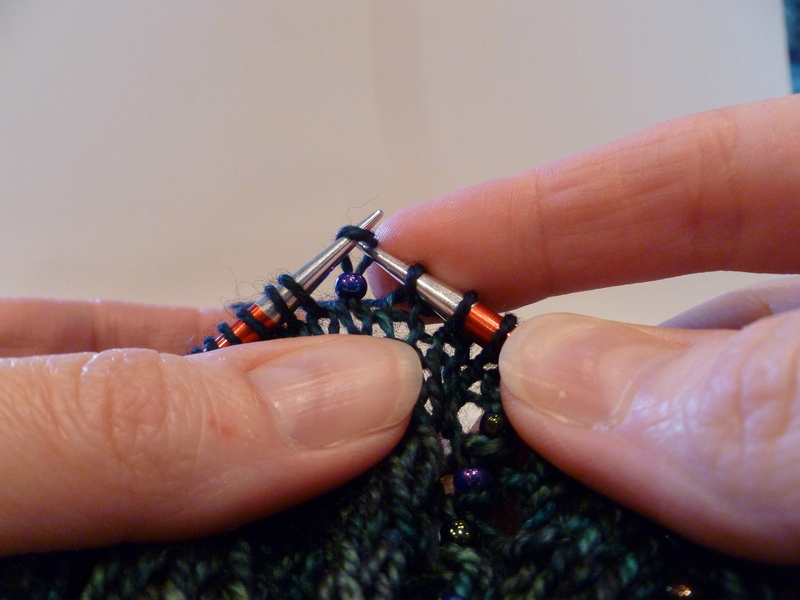 So much easier to wrap the yarn the proper way than the way I was doing it before. Pinning out all those tiny loops was slow going, but the end result was worth it. 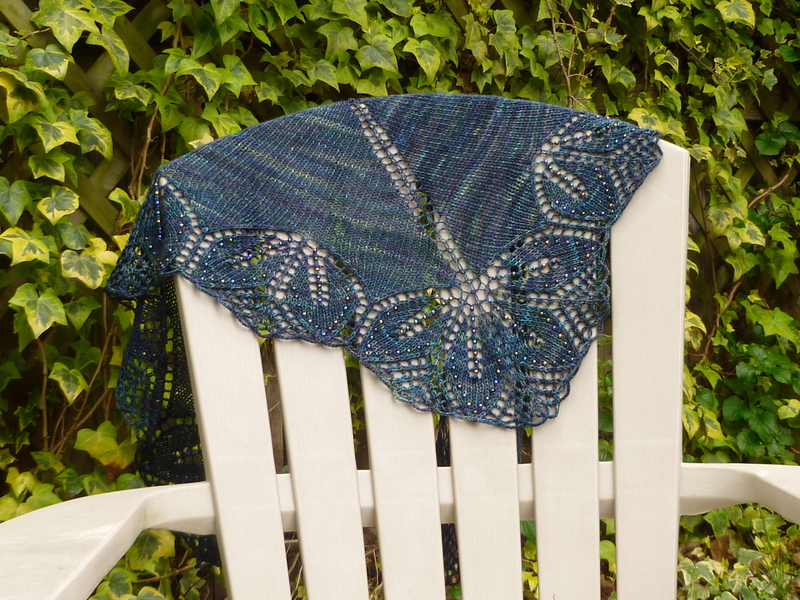 The finished shawl is gorgeous. It’s probably the most beautiful thing I’ve ever made. It’s also almost impossible to photograph properly. 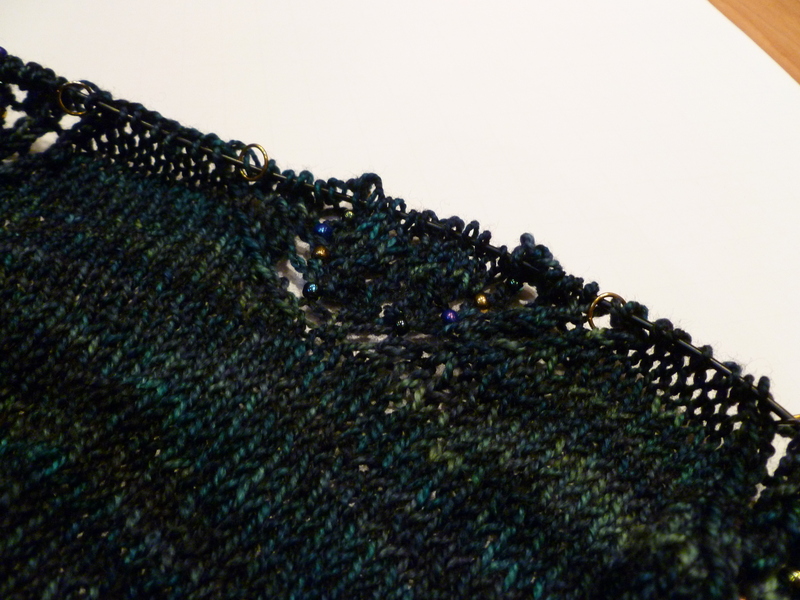 The color is mostly a dark blue, but it’s not even close to solid, with varying shades of blue, gray, green, purple… The beads I used range in color from blue, green, purple, gold to black pearl gray. They pull out the colors in the yarn exactly as I hoped they would. I got loads of compliments on it at the HYP. 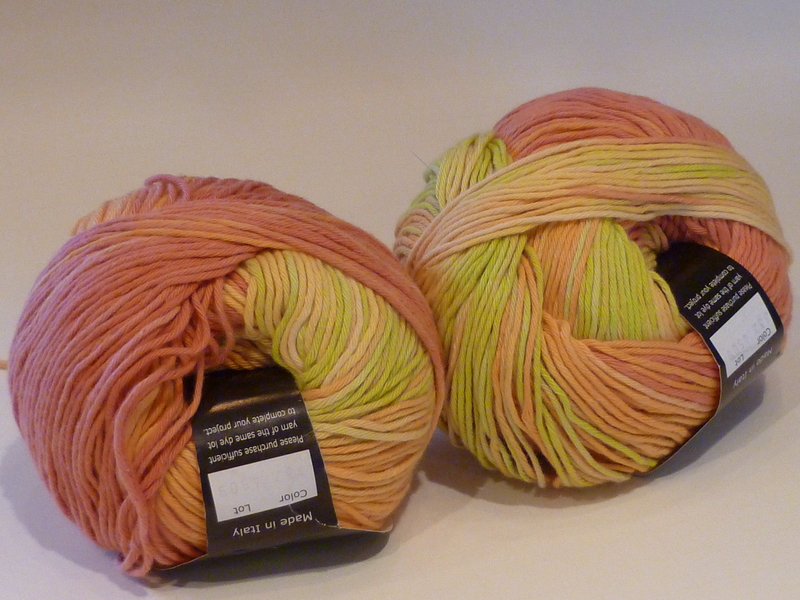 Many people were familiar with Sundara’s yarn, and apparently this colorway was in very high demand. (And everyone agreed that it was hard to photograph. Several people tried, and the results were about the same as what I’ve gotten. Here’s hoping a sunny day will help!) I lost count of the number of times people asked what the pattern was. So I would definitely count this project as a success!